Streaming television services like Netflix and Hulu Plus are gaining momentum, moving along the adoption curve – working their way through the early majority – still years ahead of technological laggards. Editor’s Note: This article first appeared on StateCollege.com in Tech Talk, a biweekly column by Eric Zimmett. Click here to view the original column. Eric Zimmett is a tech writer and small business consultant who works at StateCollege.com assisting businesses with how to navigate today’s difficult marketing and advertising landscape. A Nielsen study revealed that about one-third of Americans have streamed a TV show or movie through a paid subscription service like Netflix or Hulu Plus. And a majority of Netflix users have the service connected to their TVs. Streaming TV is the biggest threat to the pay-TV model since TiVo, poised to make prime-time television irrelevant and turn the pay-TV model upside down. Two years ago this month I cut cable and moved into the streaming TV world. Which at first was a bit rocky, but is now a more intuitive TV experience than ever. With Netflix and Hulu Plus, when I want to watch a particular show, I watch the show. Whether it’s 7 p.m., 9:36 p.m. or 2 a.m. The Colbert Report; Saturday Night Live; Lie to Me; 30 Rock; Weeds; American Pickers; MasterChef; Mad Men; The Office; SportsCenter and ESPN on Xbox 360; or even NBC News, CBS, ABC on Roku Newscaster. As well as older TV shows like Arrested Development, a new favorite of mine even though the show concluded in 2006. I had never seen it. But with streaming TV, I started with season 1, episode 1 to the last. Netflix announced in November that it is resurrecting Arrested Development in an exclusive deal featuring new episodes of the critically acclaimed series, which was canceled by Fox. Streaming, on-demand, content increases the shelf-life of television, therefore increasing the benefit to the show and its advertisers. What this means: more viewers for the content and the advertising. An almost unlimited shelf-life. Streaming TV puts the entire television experience – Movies, News, Sports, TV shows – on the user’s schedule, not the network’s. It’s like everything has been TiVo’d for you. TiVo released data that revealed only 38 percent of viewing by its users was live TV. The rest was recorded video and online streaming content like Netflix, which is now available through the TiVo Premiere box. It won’t be long before streaming content overtakes recorded content, like the two have done to live TV. Most Netflix and Hulu Plus users are between the ages of 18-34 – dubbed Generation C – according to the Nielson study released in February. The second largest group is users between 35 and 49, then 50 to 64. Which mirrors the adoption curve developed by Joe M. Bohlen, George M. Beal and Everett M. Rogers at Iowa State University in the 1950s. The curve illustrates the adoption of new products and innovations through five stages: Innovators, Early Adopters, Early Majority, Late Majority, Laggards. Netflix has more than 20,000 titles available to stream instantly and is working to increase its number of television shows, an area in which Hulu excels. Hulu is jointly owned by Comcast’s NBC Universal, The Walt Disney Co., News Corp. and global private equity investment first Providence Equity Partners. Netflix has inked exclusive content deals including Lilyhammer, which debuted Feb. 6, featuring Sopranos star Steven Van Zandt. Horror series Hemlock Grove, scheduled for early 2013. Orange is the New Black, a comedy project from Weeds creator Jenji Kohan. As well as House of Cards starring Kevin Spacey. To acquire House of Cards, Netflix outbid HBO for the series. And now dozens of devices are available to stream content, including Blu-ray players; video-game systems like Xbox 360, Playstation 3 and Wii; Boxee Box; Apple TV; Google TV; TiVo Premiere; and Roku. Read my review of the Roku streaming player here. In most cases, users buy the streaming boxes; versus renting a box from cable or satellite TV companies. Subscription streaming services like Netflix, Hulu Plus or Amazon Instant Video provide unlimited streaming content for a fixed monthly price. Some cable companies have now started to offer their own streaming content as a companion to subscription offerings, like Time Warner On-Demand, Comcast On-Demand alongside a subscription to their services; or premium cable like HBO GO and Showtime On-Demand. Strictly video-on-demand (VOD) services like Vudu are essentially today’s Pay-Per-View, with each movie available to rent or purchase. This doesn’t mean an end to live TV content, however. Live TV will be delivered through the Internet and available on-demand after it airs. Comcast, the largest cable operator, announced in May of 2011 it would begin testing IPTV or Internet Protocol TV. The same content, only, delivered through the Internet. Comcast began testing IPTV at the Massachusetts Institute of Technology (MIT), and in February introduced XFINITY Streampix, a Netflix-like video service offered as a companion to XFINITY TV. IPTV can be used for live video, streaming and delayed programming like a DVR. The same technology used by Netflix, Hulu Plus, Roku, live-streaming services like U-Stream and Live Stream. What IPTV will one day mean for advertisers: data. Think Google Analytics for TV. Netflix and its competitors will force cable, satellite and premium cable companies to overhaul the formula and their pricing structure. Turning the entire landscape upside down. Lower prices, more content, delivered IPTV-style. It’s a monumental time for TV. If cable and satellite TV are scared now, this could very well be the calm before the storm. They’ll be forced to change or fall into obscurity. Like a stagnant MySpace, ignorant to the startup that would become Facebook. Streaming content has transformed the way I watch TV and will soon change TV forever. The cable and satellite networks can fight all they want. TV 2.0 is coming. Their efforts are only delaying the inevitable. While Netflix was busy battling HBO over exclusive content and providing an increasingly valid reason to cut the cable-cord, Sony’s Crackle just kept building. Adding content, signing advertisers and launching on an array of devices including Xbox 360, Roku, Sony Blu-ray players, Sony Internet-connected TVs, Android, iPhone, iPad and more. Its time out of the spotlight paid off. Now it’s clear that Crackle, which launched in the summer of 2007, is a contender. Opting for an ad-supported model — the lifeblood of terrestrial radio — Crackle is free on all devices. It’s a proven formula: Free service = more users. More users = more ad dollars. Great method for generating revenue and users. Other ad-supported services: Terrestrial radio and now Pandora and Slacker, Facebook and websites (see those banner ads? They’re paying the bills.) All ad-supported. Crackle’s fresh content and smooth interface makes it feel like mini-Netflix. Hundreds of movies, clips and made-for-TV content. Plus the only place away from DVD you’ll find Seinfeld, which features 10 new episodes episodes each month. Movies, Clips and TV like Spider Man 3, Ghostbusters, 21, Pineapple Express, Year One, Talladega Nights, Cruel Intentions, Passengers, Joe Dirt, Vacancy, Stranger than Fiction, 8MM, Basic Instinct 2, TV shows like Seinfeld and News Radio. Crackle reports nearly 300 movies. More than 100 TV shoes and around 50 original TV shows featuring made-for-Crackle content. Sure the library’s not as vast as Netflix or even Amazon Instant Video, but it’s free and available on a growing number of devices. Crackle is mysteriosly absent from PlayStation 3, even though Crackle itself is a Sony service. Crackle lists that it’s available on PS3, though only through the PlayStation web browser. It’s not currently available on PS3 in app-form. Venture Beat reported today, however, that Sony is preparing to announce a new video service for PS3. Rumored to involve Internet channels or apps. (An idea we suggested more than a year ago.) The new service would likely include Crackle. Some devices as of late now require the Crackle user to login with a username and passord. Which tells me Sony wants a more accurate count of users and active users for advertising. Like Netflix or Hulu, Crackle users can add content to a queue or choose to subscribe to TV shows. And its mobile and iPad versions are smooth and attractive. Crackle’s almost ready for the big leagues. And its timing is near-perfect. Though it’s entering a crowded marketplace, not one has presented itself as a real Netflix competitor. And I wouldn’t count anyone out. Introducing FIVE TECH PREDICTION FOR 2012. Zimedium called it on May 8, 2011. In a post titled My predictions for Internet TV and the future of Cable. 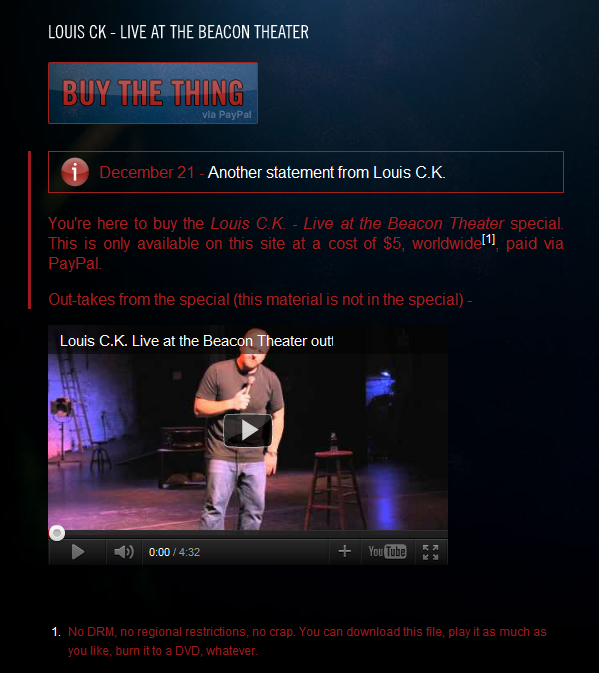 Louis CK’s special is only the beginning. In 2012, more will follow his model. Entertainers, content providers, even premium cable channels. Ads customized to your interests. Google does it best. Hulu’s already doing it with in-show ads and its Ad Swap feature. You can select what you like instead of watching what Hulu thinks you’ll like. Facebook does it. Facebook displays ads based on what fan pages you like. Foursquare does it too, by offering suggestions based on where you check in. Foursquare co-founder Dennis Crowley discussed the company’s Explore/Recommendation engine at LeWeb 2011 in early December 2011. Ads based on what you “like,” tweet, check-in, watch. Information you provide both voluntarily and data acquired based on your actions. Get ready to not hate the ads that interrupt your programming…at least not quite as much. In 2012, Customized Advertising will be king. Whether you’re aware of it or not. We called it an entire year ago, on Dec. 27, 2010. In a post titled When will PS3, Xbox, Wii incorporate Internet TV. “…When will Sony, Microsoft and Nintendo enter the [streaming content] game themselves? Doing so would offer another bit of differentiation, another perk for owners of each console. “Who will be the first to fully embrace streaming content or Internet apps? Xbox 360 introduced its revamped dashboard one year later, in early December of 2011. The new dashboard featured Internet apps including Netflix, Epix, SyFy, ESPN, Daily Motion, NBC News, Zune, YouTube and Live TV integration if you have the accompanying cable subscription. In 2012, Xbox will roll out more apps and the rest will follow. It’s only the beginning. The future video-game console will be a complete media hub with dozens, possibly hundreds of channels and apps. I hate the term “cloud storage.” Makes me think the cloud is only for backing up files. In 2012, the Cloud will become more than a backup service. Cloud for movies…music…pictures… and our movie libraries. (I’m looking at my collection of DVDs and Blu-rays right now.) In 2012, our movie collection will extend to the cloud. Blu-rays already come with digital copies. How about a specially formatted “cloud copy”? Through a few missteps in 2011, Netflix has enjoyed practically zero competition (or at least serious competition). Its maintained the largest number of video subscribers anywhere and built up its library of streaming content. Plus exclusive content on the way. Zimedia predicts in 2012, one new company (or a service from a partnership of companies) will emerge as the biggest competitor Netflix has seen to date. But it won’t be the death of Netlfix. In fact, few industries survive without competition. It’s good for business. It fosters growth, sometimes re-invention, and an improved user experience. Swapping pay-TV for Internet streaming services like Netflix is the latest trend for tech savvy consumers looking to cut rising cable costs in a tough economy. But for those new to Internet TV with little or no knowledge of the streaming landscape, things might look a little confusing. That’s why most haven’t taken the leap. Too many options. And no clear way to get started. What are the best services? Is Netflix the only option? How do I get the content to my TV? How many TVs can I connect it to? Does the video content get old? How often do they add new content? For all of those questions and more, I’m happy to introduce the first edition of Getting Started. Getting Started with Internet TV. Netflix is the top dog in on-demand movies for $7.99 per month for unlimited streaming (and no DVDs by mail). Netflix is also rapidly increasing the number of television shows on its roster and has even signed a deal to bring House of Cards exclusively to Netflix, beating out other bids from HBO and others. 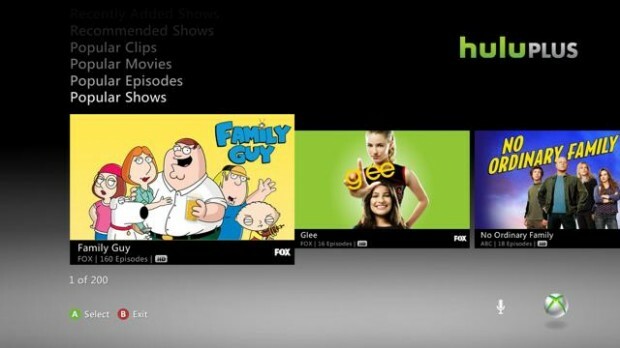 Hulu Plus is to TV shows what Netflix is to movies. Hulu Plus is also $7.99 per month. Beyond Netflix and Hulu Plus, the competition drops off. Among the next tier of performers is Amazon Instant Video ($79/year) that also includes free two-day shipping on Amazon.com; Ustream (free); Crackle (free), PlayOn ($5 per month); among others. Most subscriptions are month-by-month and can be canceled at any time. Once you’ve selected which service you’ll use, go to the website and sign up online. Most services offer a trial period of either one week or one month. Once you’ve signed up, just jot down your username and password. We’ll need that later when we connect it to your TV. At least 3 megabits per second (abbreviated 3 Mbps). The faster the better. You can connect your device to your TV through an Ethernet cable or wirelessly through your home network. To set up a home network, you’ll need a wireless router. However streaming quality is better if the connection is hard-wired with the Ethernet cable. 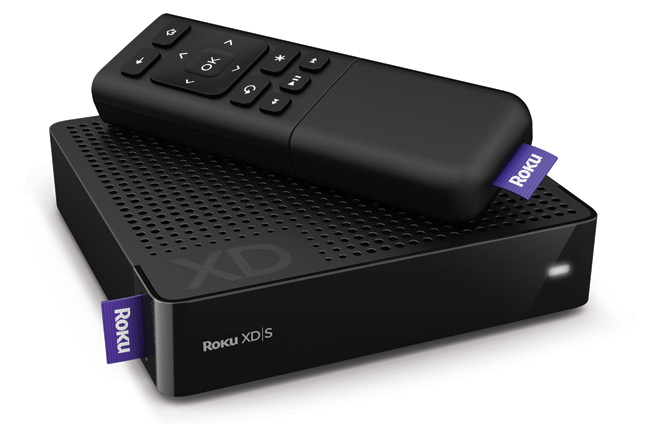 A Roku XDS. Roku recently introduced the Roku 2. Check the specs for each device to compare features and connectivity options to make sure your device will work with your selected service. 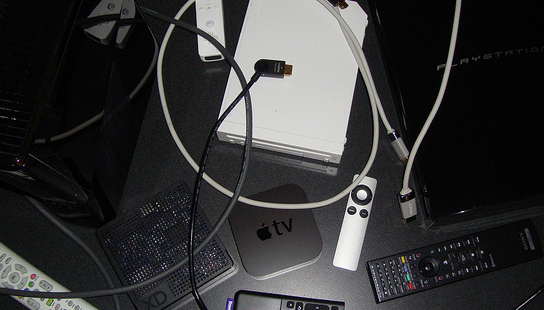 Hundreds of available devices are ready to connect your TV to Internet video. Take your pick. 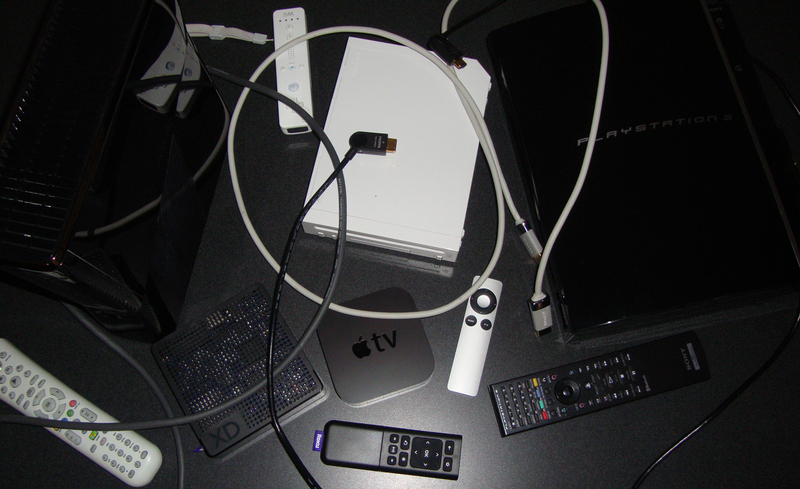 Blu-ray players; Video-game systems including Xbox 360; Playstation 3; Nintendo Wii; and streaming boxes like Roku, Boxee, D-Link, WD, Apple TV and hundreds more. Just check the box — or online — to ensure it connects to Netflix, Hulu Plus or other Internet channels. Everything will be clearly labeled. If it’s not on the box, look online. Just make sure your selected streaming service is available on the device. If we want Netflix, we’re good to go with the Sony BDP-S570 Blu-ray player pictured below. 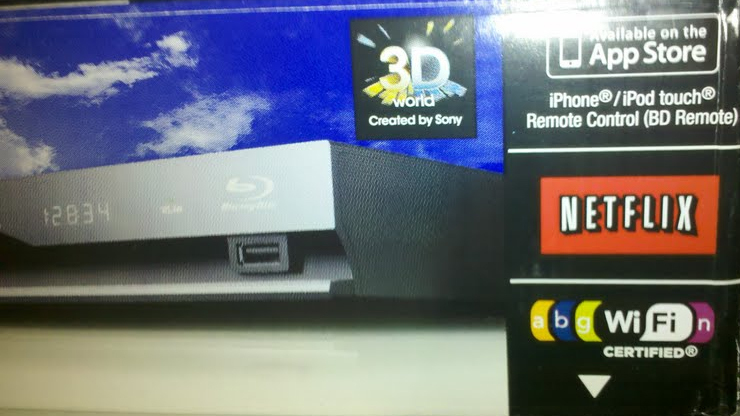 Packaging for a Sony Blu-ray player, showing Netflix as a featured partner. If it’s not clearly labeled on the box, check online before purchasing. Most devices connect to at least Netflix and Hulu Plus. Some devices feature different channels, like Ustream or Crackle by Sony. Few channels are exclusive. Some TV sets also come with channels like Netflix, Hulu Plus or Crackle built-in. As well as Blu-ray players. Purchasing a Blu-ray player that connects to Netflix or Hulu Plus is a great way to bring high-quality Blu-ray content into your home as well as thousands of on-demand offerings. 1. Connect device to your TV. 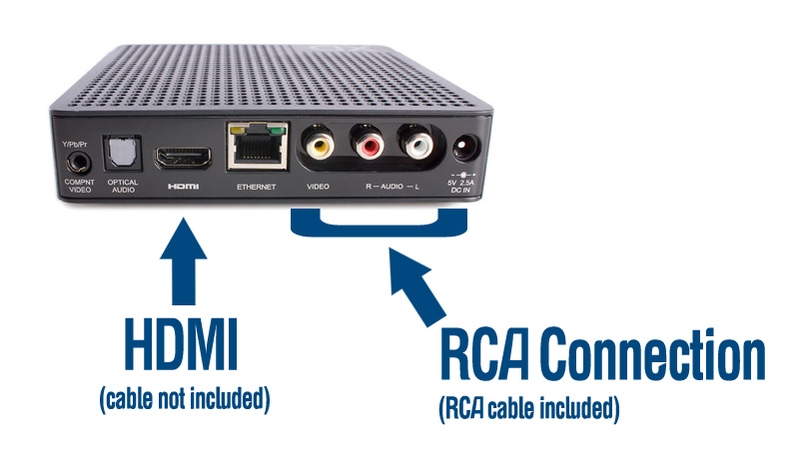 HDMI is best but some devices allow RCA connection for older television sets. After the device is hooked up, then it’s as simple as changing the video input like you would for a video-game system or DVD player. 2. Connect to the Internet. Connect your device using either a wireless network or wired setup using an Ethernet cable. Connecting your device via Ethernet is the quickest way to get set up and also offers the highest quality streaming. Once the cable is connected to both your modem and your Streaming Device you’ll be connected. For a wireless connection, you’ll need to search for the wireless network and sign in. Launch your Streaming Device and select your desired streaming service, i.e. Netflix. Use the username and password you selected when you signed up online. You’ll need to verify your device with your streaming subscription. You’ll be given a code that you’ll need to enter online to link the device and service. You’ll only need to do this once. It’s used to verify your subscription and link the device to your account. You’ll be able to use your streaming account on any number of televisions; the subscription is not tied to any single TV. If you’re adding a box to another TV in your house, you’ll use the same login info. You’ll just have to verify each streaming device with your subscription using a new code, supplied when you launch the service for the first time on each TV. You can also connect multiple accounts to your streaming device, i.e. Netflix and Hulu Plus. The most compelling difference between content on pay-TV and Internet TV is cost-vs-content. With pay-TV, you pay more for additional content; with Internet TV, you get increasingly more content for the same low monthly price. Netflix is signing new deals and bringing new content to its service on a monthly basis. Same goes for Hulu Plus. The rest are playing catch-up. Which is a win for the Internet TV consumer and the competing services. Increased competition will only expand the amount of programming and the quality of content deals. For more on Internet TV, check out related posts below. Now six years old, Microsoft’s Xbox 360 is a veteran entertainment powerhouse, combining high-def gaming, hands-free control with Kinect, Internet video from Netflix and Hulu Plus and live streaming video from ESPN. What more can you ask for from an aging console? Well, how about Live TV integration and Skype? “This is only the beginning,” said head of Xbox Live Mark Whitten at E3 2011. Microsoft announced on June 6, 2011 that Live TV is coming to Xbox 360 this fall via Xbox Live. Head of Xbox Live Mark Whitten failed to give concrete details on Live TV but in an interview with The Seattle Times, Microsoft’s vice president of global marketing Mike Delman shed a little more light on the service. “It will be tied to either a satellite broadcast company or a cable company. So in international markets, you’ll just have one provider. In the U.S., it will be bifurcated by region, by market. You’ll be a Comcast guy [in Seattle], for example,” Delman told The Seattle Times. Other soon-to-appear features were unveiled at E3. In addition to Live TV, Xbox is getting YouTube, Bing and complete voice control through Kinect. Xbox Kinect was introduced in Q4 2010. Since its inception, Kinect has helped push Xbox 360 sales and offer a new way to game, to control and to experience living-room entertainment. According to Reuters, Kinect has sold 10 million units since its launch last fall, becoming the fastest-selling consumer electronics device. The motion device allows users to control Kinect-compatible games and applications via gesture and voice commands, completely controller-free. “You no longer have to navigate through the menus to find content,” Whitten said of Kinect at E3. According to CNET’s Erica Ogg, when Bing is introduced, users will be able to use its search function to find more content to watch by searching the web, YouTube, Live TV and all the services on Xbox Live including existing services like Netflix and Hulu Plus. The Kinect’s voice control will also allow users to search for content with voice commands. Skype is coming to Xbox 360’s console via Xbox Live after Micrsoft’s $8.5 billion acquisition of Skype in May. The pairing of Kinect and Skype makes perfect sense, and moves Microsoft’s Xbox to another area of our lives: business and communication. Microsoft’s acquisition of Skype must still reportedly receive regulatory antitrust approvals before the deal is finalized. Behind every announcement, every acquisition and every new feature is Xbox Live. Microsoft clearly has big plans for its Xbox Live service. According to WinRumors.com, Xbox Live will be built into Windows 8, Microsoft’s next operating system. The service was recently introduced on Microsoft’s Windows phone. 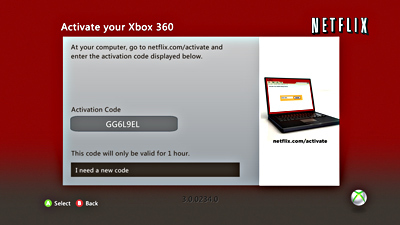 A subscription is required to access Xbox Live and its growing list of services. Namely, Netflix, Hulu Plus, Live and On-demand video content from ESPN and some of the best streaming news content available anywhere with NBC News. With the NBC News channel on Xbox Live, users have on-demand access to today’s news in a variety of categories, most of which contain 15 clips from the most-recent episodes or topics. NBC News on Xbox Live offers on-demand, up-to-date news content, allowing users to pause, fast-forward and rewind commercial-free news content. It’s by far some of the best streaming news around, second only to Roku’s Newscaster. I’ve told you before that if I had to pick one streaming box it’d be Roku. I still feel that way. But if I had to pick one gaming system, it would be Xbox 360. Apparently I’m not alone. In the console’s sixth year on the market, Xbox 360 sales continue to increase at an unprecedented rate. We may one day look back on 2011 as the year that video game systems became more than a simple toy. Microsoft has successfully launched and maintained a true home-entertainment hub. Games. Video. Kinect. Search. Live Streaming Video. And now Skype. Xbox 360 has far surpassed the normal shelf-life of video-game systems. And with sales still on the rise, Microsoft seems to have the game figured out: Innovation. With Kinect and streaming video from Netflix, Hulu Plus, ESPN and NBC News, Microsoft is not only following the movement; it’s leading it. A Netflix-red-hot topic on this blog and certainly in the tech world is the rise of Internet TV and the belief that it will some day replace cable TV as our chief source of home entertainment. In previous posts, I’ve covered My Cord-Cutting Experience; Netflix; Hulu Plus; Roku; and even my comprehensive Internet TV Guide. Now I’d like to offer a few predictions on the current status of these services and the future of Internet TV and pay TV based on my first-hand experience and research over the past 13 months. First let’s take a look at the playing field. Right now we’ve got powerhouse Netflix. Then Hulu Plus. And Amazon Instant Video. And other services like Crackle, PlayOn, and Internet Apps from a variety of providers including Roku, Sony, Apple, Google, Samsung, Vizio, Boxee and more. Note the very distinct difference between unlimited streaming like Netflix and video-on-demand (VOD) services like Vudu. An example: Warner Bros. recently announced a deal to rent movies through social-networking behemoth Facebook. Many news outlets suggested this deal, through Facebook, would challenge Netflix. That’s dead-wrong. The deal, as it stands now, is video-on-demand. A charge per Warner Bros. movie –a version of yesterday’s pay-per-view — not unlimited streaming. There’s a feeling you get when you graduate high school and head off to college. It’s a special kind of freedom that’s hard to describe. You can make your own decisions. Stay out late and do pretty much whatever you want. Hulu, on the other hand, is still living at home. And its parents watch cable. Hulu is jointly owned by Comcast’s NBC Universal, The Walt Disney Co., News Corp. and global private equity investment first Providence Equity Partners. In the sale of NBC Universal to Comcast in late January, GE had to relinquish its decision-making power and 32% stake of Hulu. (See my media ownership post here.) The deal gave Comcast 51% control of NBC Universal, now labeled NBCUniversal (no space and no peacock). Previously, GE owned 80 percent. Prior to the sale, GE purchased the remaining 20 percent stake from Vivendi Universal. GE’s stake in NBCUniversal is now 49 percent, though according to USA Today the company plans to completely remove its shares over the next eight years. With Comcast holding stake in Hulu, I don’t see how Hulu Plus will fully commit to Internet TV in fear of making cable obsolete. That is, if Comcast has anything to do with it. Studios and cable companies still seem hesitant to enter the streaming game full-steam. In part because it threatens pay TV and also because nobody knows where it’s headed. Fear of the unknown. But the conversion is happening, albeit slowly. It will likely continue at that pace until we reach an Internet-TV tipping point. Watch for studios to start their own services on a smaller scale. I predicted just last week that premium cable channels like HBO and Showtime would roll-out their own subscription-based offerings. From the Business Wire release: Warner Bros. Home Entertainment Group will utilize the powerful Flixster brand and technical expertise to launch a number of initiatives designed to grow digital content ownership, including the recently announced consumer application “Digital Everywhere.” This studio-agnostic application will be the ultimate destination for consumers to organize and access their entire digital library from anywhere on the device of their choice, as well as to share recommendations and discover new content. The Flixster acquisition and “Digital Everywhere,” combined with the Studio’s support of the UltraViolet format are all part of an overall strategy to give consumers even more freedom, utility and value for their digital purchases. I’d watch for more studios and content owners to explore options for skipping the middle man and becoming the means of distribution for their content. Studios like Disney, CBS, Viacom, and premium cable like Starz and Encore (both owned by Liberty Media Corp.) will all look in this direction. At first, simply to supplement their current revenue model. Recent rumors had big firms like Amazon, Best Buy, Walmart, Hulu and Dish Network teaming up to potentially launch a Netflix competitor. Netflix is gaining a huge lead — the company just surpassed Comcast’s pay TV subscribers as the largest video-streaming service in North America –but in time there will be a number of subscription-streaming services. With overlap in content. For example, Netflix and Hulu offer some of the same programming or channels, while other programming is exclusive to the provider. Much like the DirecTV-Dish battle of today. (Or Netflix vs. Hulu Plus.) Only I see more competitors in the ring. Right now, in 2011, we’re witnessing the easy part. There’s a clear distinction between pay TV and Netflix. Wait five years and we’ll see the transition taking place: cable companies — like Comcast, Time Warner, Viacom, and even satellite TV providers Dish and DirecTV — developing stand-alone Internet-TV subscriptions, separate from their pay TV plan. So, at that end-point, what will be the difference between pay TV and TV over Internet, other than the means of distribution? First, the customization. Consumers will choose what content they want and when they want it. Whether it’s subscription services like Netflix or specific channels like, say, HBO’s Internet Channel. Second, the cost. The cost will be more in the Internet service and the streaming box, instead of paying to receive 300 predetermined channels. Subscriptions to our content will have to decline, as we see with Netflix subscription rates compared to that of a typical cable plan. A few final talking points if pay TV as we know it today will move online and stream to our living rooms. 1) Live Newscasts; 2) Live Sporting Events; 3) Local News; 4) Advertising and 5) Local Advertising. Live News is already happening on Roku, on the free Newscaster app. Al Jazeera streams live all day. In fact, I’m watching the live Al Jazeera stream as I write this section. So the capability is there. And Roku has a DVR-like function that lets you pause, rewind and resume the live feed. How about Sporting Events? Xbox 360’s got that covered with its ESPN 3 app featuring live broadcasts and up-to-date sportscasts on a variety of sports. Roku’s got live coverage too including MLB TV, NBA Game Time, NHL and UFC. Local News is now streaming as well. Roku announced via Twitter on April 16 that it had added the first local news broadcast, Channel3000, a CBS News affiliate from Madison, Wisconsin. Roku pulls video from Channel3000′s website and makes it playable for free on the Roku player. National News is better than ever on-demand with Xbox 360’s NBC News channel. Update: Roku introduced an NBC News channel in December of 2011, as well as CNBC Real-Time and Wall Street Journal Live. Now Advertising. Hulu Plus has done the best job of incorporating video advertising into its content, using the pay TV model, ads within programming. A few of Roku’s internet apps have video ads as well as banner ads. How about Local Advertising, targeted just like Internet banner ads, based on location determined by the user’s IP address? But probably the greatest potential for the future of TV advertising is the connectivity. Imagine a television ad with a purchase, more info or social media one remote-click away. It’s like cable, only customized and connected to the Internet. And on the consumer’s schedule. Almost as if every show on TV was Tivo’d for us. The consumer decides not only what content is displayed on his or her dashboard, but when it’s on. Within the next 10 years, I see the Internet as our means of distribution for all television content. As broadband access becomes ubiquitous, like mobile phones and smartphones after it, the future of pay TV will be clear. Combine Netflix’s vast library of TV and Movies, Roku’s app-interface with the ad-model of Hulu Plus and mix in ESPN3’s live sports on Xbox 360 and you’ve got the future of pay TV. We have the capability of all of these services today. It’ll just take someone to put it all together. The future of TV is one box, connected to all of our subscriptions and video content including Movies, TV, News, Sports, Weather, Netflix, Hulu Plus, Local News channels, Live News and Live Sports. All at our fingertips. A media hub, allowing consumers to pick and choose the content they’d like displayed on their dashboards. A La Carte television. Complete consumer control.